Den of Geek(31st) - Did you spot what was hiding in the Doctor Who trailer? Portland Mercuty(30th) - To the TARDIS! There's a New Doctor Who Trailer! The Sun(31st) - Who is kissing River Song? Geeks of Doom(26th) - Watch Now: Prequel Teaser Video For ‘Doctor Who’ Series 6! Anglotopia(25th) - Doctor Who: Series 6 Prequel Video Here Now! Bleeding Cool(24th) - The Latest Doctor Who Trailers… Are They Haunted? Digital Spy(23rd) - A new 'Torchwood: Miracle Day' poster! Huffington Post(30th) - Carey Mulligan, Marcus Mumford Dating? Chichester Observer(30th) - AUDIO CD REVIEW: Doctor Who: Demon Quest 4 - Starfall, BBC Audio CD. flick filosopher(25th) - ‘Doctor Who’ thing of the day: TARDIS spotted in Farmville! University of Southampton(25th) - What's inside a Dalek? CTVglobemedia have issued a press release reporting on the Season 6 premiere date for SPACE, Canada's science fiction channel. Trust him, he’s The Doctor. As announced last night on INNERSPACE, DOCTOR WHO returns for another round of heart-pounding adventure with the watch-with-the-world Season 6 premiere Saturday, April 23 at 8 p.m. ET, only on SPACE. The recharged DOCTOR WHO series sees the return of Matt Smith as 11th Timelord and Karen Gillan as his feisty partner in time, Amy Pond. Behind the scenes, award-winning writer Steven Moffat, returns as the lead writer and executive producer. Before the new season takes off, fans can travel back in time and catch up on all their favourite episodes with the DOCTOR WHO marathon. Beginning Thursday, April 21 at 9 p.m. ET/PT, SPACE transports viewers back in time with the final four DOCTOR WHO specials, starring David Tennant. Then SPACE reboots Season 5 starting Friday, April 22 at 2:30 p.m. ET/PT, leading up to the Season 6 premiere on April 23, followed by the Christmas specials, Sunday, April 24 starting at 12:05 p.m. ET. Viewers can also catch up with The Doctor with encore viewings on SPACECAST.com. In the two-part Season 6 premiere beginning on April 23, The Doctor, Amy and Rory travel to 1960s America, taking them from the Utah desert to the Oval office. The season was filmed in North America for the first time in series history. Alex Kingston (ER) reprises her role as River Song, while Mark Sheppard (SUPERNATURAL) guest stars as Canton. For an extra dose of DOCTOR WHO, viewers can check in with genre experts and hosts Teddy Wilson and Ajay Fry of SPACE original series INNERSPACE for updates, interviews and behind-the-scenes footage. DOCTOR WHO is also available on demand at spacecast.com immediately following the television premiere. SPACE is Canada’s national science fiction, horror and fantasy channel. SPACE is truly the boutique station for all those who dare to challenge their imagination (www.spacecast.com). SPACE is owned by CTV Limited, a division of CTVglobemedia, Canada's premier multimedia company. The BBC Press Office have released information about a new competition which gives a team of UK primary school children the chance to write their own Doctor Who mini-adventure starring the Eleventh Doctor, Matt Smith. To herald the new series of Doctor Who, BBC Learning and Doctor Who Confidential today announced Script To Screen, an exciting competition that will give one lucky team of school children the chance to write their own Doctor Who mini-adventure starring the Eleventh Doctor, Matt Smith. To win this once-in-a-lifetime opportunity, school children aged 9 to 11 years will be encouraged to collaborate on a three-minute script that takes the resident Time Lord on a new quest travelling through space and time inside the TARDIS. The lucky winners will travel to the BBC's studios in Cardiff where they will see their script brought to life by the Doctor Who team and cast, including Matt Smith. Doctor Who Confidential will also be on hand to take viewers behind the scenes to show how the script gets developed from paper to television screen – from the first script meeting, a cast read-through, on-set filming... all the way to the final edit. Saul Nassé, Controller of BBC Learning, said: "Doctor Who is loved by children across the UK, and I can think of no better programme to inspire the next generation of story tellers. "The Script to Screen competition is a fantastic way for children to learn new writing skills, whether or not they are winners. We are delighted that the stellar cast and crew of Doctor Who are on board for this journey of learning through time and space." Children can be as creative and imaginative as they like in order to put together a story that's filled with all the excitement and adventure of the popular BBC One sci-fi drama. The action-packed script must feature Matt Smith and can include one of four fearsome monsters/aliens from the show: Ood, Judoon, Cyberman or Weeping Angel, as well as a brand new human character to test the wits of the Doctor. Tailored learning resources will be available on the BBC Learning website to help guide teachers and pupils through the process. BAFTA winner and head writer at Doctor Who, Steven Moffat, will also offer his expert advice and helpful tips on how to pull together a stand-out script with memorable characters. Steven Moffat said: "Doctor Who made me want to write. It made me fall in love in television, script-writing and storytelling, and led me by the hand to the best job in the world. It also made me want to defend the Earth from aliens but that hasn't come up so often. "I know the power this show has to set young imaginations alight, because I've lived it, so I'm incredibly excited to be involved in this project. Plus it's never too early to start looking for your replacement." The winning script will be chosen by Steven Moffat, Saul Nassé and executive producers of Doctor Who, Piers Wenger and Beth Willis. Full details of how to enter the competition are available on bbc.co.uk/teachers. Downloadable BBC Learning resources will be available from 23 April 2011 and the closing date for entries Monday 13 June 2011. 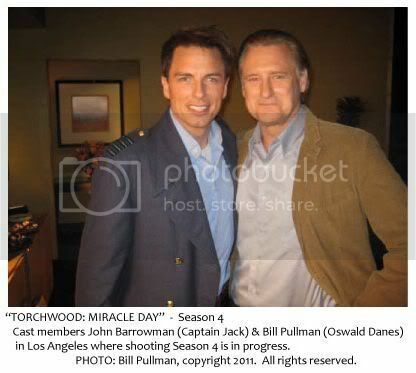 BBC Worldwide have issued a press release reported on an appearance by two lead actors from Torchwood: Miracle Day at the Cannes Film Festival to promote the show, namely John Barrowman (Captain Jack Harkness) and Bill Pullman (Oswald Danes). In addition to Torchwood: Miracle Day, BBC Worldwide will also be presenting popular returning series Doctor Who (S6), the critically-acclaimed Luther (S2), series three of Being Erica, Primeval (S4&5), and the second series of the BAFTA winning Misfits. Quite a busy few days, with both a Doctor Who Series 6 Teaser (two of them to see on TV! ), and Starz revealing Torchwood's Miracle Day premier as 8th July. And amidst the recent novelisation re-releases, a previously un-novelised story Shada will see print. Comic Book Movie(23rd) - DR WHO Season Six Teaser/Prequel Trailers Online! Big Shiny Robot(23rd) - Torchwood: Miracle Day July 8th! Comic Book Movie(23rd) - Torchwood: Miracle Day Gets a Premiere Date and Promo Poster! TV|Line(23rd) - Exclusive: Torchwood: Miracle Day Premiere Date and Poster Revealed! TV Shows on DVD(23rd) - Doctor Who - The Only Unreleased/Unannounced 5th Doctor (Davison) Story is Now Scheduled for DVD! Two main television events dominated the news this weekend. Red Nose Day on Friday saw Space and Time, a Doctor Who mini-episode shown, which helped eventually raise over £74m for Comic Relief. Meanwhile, Matt Smith took on the role of Christopher Isherwood in Christopher and His Kind, broadcast on Saturday - an interview in the Telegraph caused a number of media sites to get confused, thinking a comment by Smith on returning to Who filming for another year meant he confirmed for Series Seven, whereas the interview was actually conducted in 2010 (before Series Six started filming!). Doctor Who related connections did well in the RTS Awards. A fan reputedly came up with the original design of Davros! Finally, Michael Gough sadly passed away. Pernarth Times(17th) - Who's that filming in Penarth....? Anglotopia(18th) - Doctor Who: Red Nose Day Comic Relief Doctor Who Mini-specials Here Now! CBBC(16th) - CBBC shows win top TV prizes! Barry and District News(19th) - Barry pupils take on the fearsome Dalek! SFX(17th) - Who’s Who? Tell Us! BBC News(17th) - Quiz: Science fact or fiction? flick filosopher(16th) - ‘Doctor Who’ thing of the day: so where does Amy sleep, anyway?